With a growing number of Lego sets seemingly targeted at AFOLs (Adult Fans of Lego) in recent years, it’s easy to find yourself agreeing with ‘The Man Upstairs’. The sophistication and ingenuity of design is surely wasted on children as a mere play thing! At the same time, it is so much more than an ‘inter-locking brick system’; it is, in fact, a philosophy of education. Allow me to explain. Stage 1: For most people, the very first experience of Lego is invariably with a simple construction kit. We carefully and unwaveringly follow the instructions, simultaneously beginning to understand first principles as the model takes on both shape and strength as each piece interlocks with the next. In the same way, our broader educational experience begins with neatly colouring inside the lines before moving on to learn and replicate the ‘rules’ of multiplying fractions, conjugating verbs or balancing chemical equations. Following established principles in this way provides essential foundations for all our future learning. Yet it is only the start of our learning journey. Stage 2: The Lego builder takes their model kit, admires their achievement for a moment but then wonders, “What if …?” Then comes more weapons, bigger wheels, more moving parts or even the addition of a motor. The KIT builder has evolved into a MODer: they have taken the underlying principles outlined in the instructions, but have then gone on to modify and even improve upon them. So too must students be given the opportunity to try and solve problems in a slightly different way; to innovate and not to replicate. Now comes the greatest challenge of all for the Lego enthusiast; a large pile of bricks and absolutely no instructions. It is time for a MOC (My Own Creation). In the same way, all students must ultimately reach the pinnacle of Bloom’s Learning Taxonomy and construct, create, formulate or write their own original composition. From first principles to ground-breaking discoveries, Lego has it covered. Yet is this really what founder Ole Kirk Christiansen had in mind? For him the idea was as simple as the name itself: ‘Leg Godt’ (Danish) = Play Well. At Kingston Grammar School we have been trying to stay true to that principle whilst also fulfilling the School’s motto, ‘Work Well & Be Happy’. 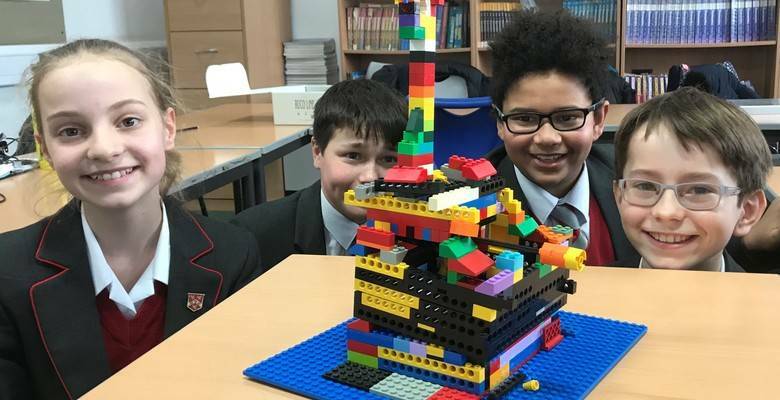 Faced with a pile of bricks and no instructions, our Year 7 students have been given the opportunity to do nothing more than play. The notion of ‘playing’ can, in fact, serve as an antidote to so many of the pressures and demands that young people face. Whether it’s a social and collaborative experience as in the case of our ‘Be Happy’ PSHE programme or something you choose to do on your own, ‘play’ promotes creativity, and provides relaxation and stimulation in equal measure. In an age of diminishing attention spans, it is also a rare thing to see groups of students so completely engaged for the 45 minutes or so of build time. I know that not everyone will share my passion for the humble plastic brick, but I hope that all of our students will take another of Lego’s ideals and ‘imagine the possibilities’ in all that they encounter.